Plant Whatever Brings You Joy » Oh, Happy Spring! 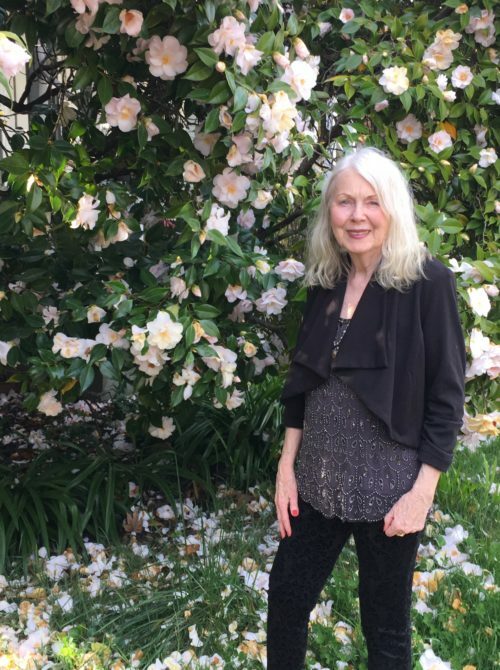 Worldwide, it would seem, we have patiently–or not so patiently–been awaiting a slow to emerge spring. I must confess to hoping and praying that spring would smile on me for my March birthday celebration, (and I did get my fondest wish!). 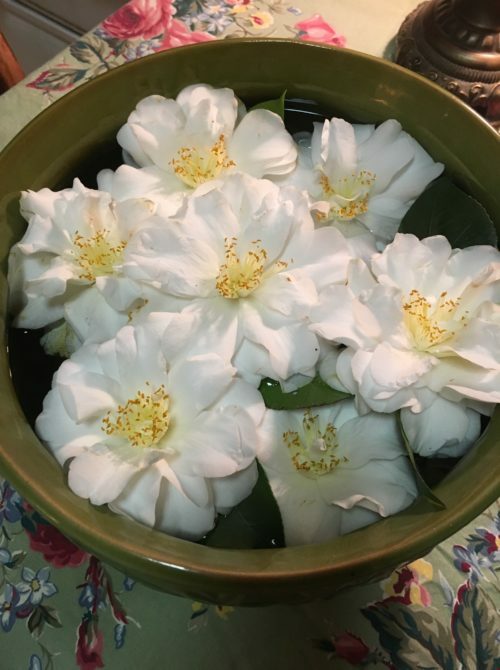 Yet, while other gardeners were either frolicking in or grimacing over snow I could not complain, as, while waiting, I was once again blessed by being immersed in the splendor of the many camellias that grace this property. Their blossoming is one of my most prized annual treasures in this garden. 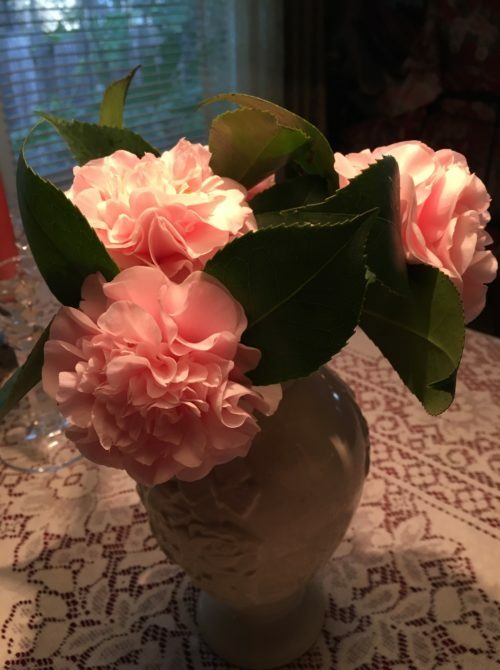 When it came to bringing them inside, ordinarily I have arranged them in various vases and placed them on tables and dressers throughout my home, which I have always very much enjoyed, as you might imagine. But this year my dear friend, artist Eta, suggested I float them instead, which somehow had never occurred to me before. So I pulled out a couple of large bowls and began to play with this idea, excited by this perfect way of showcasing their beauty. 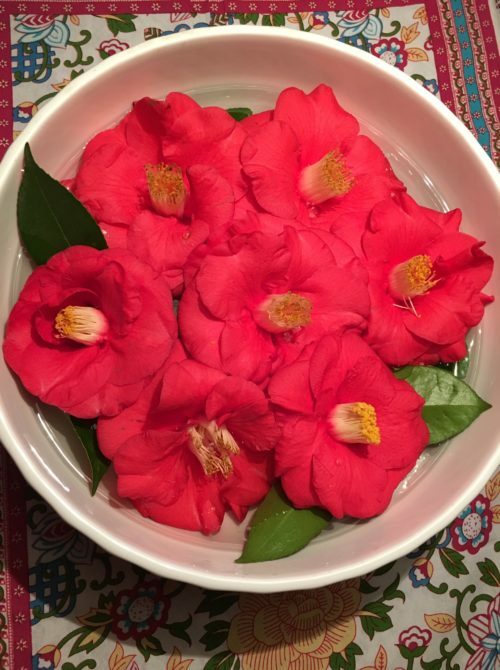 Each week as new blossoms opened I found myself refreshing these bowls with red, pink and white gorgeousness, reminiscent of my delving into making flower mandalas, for, indeed, they served beautifully as a new form of mandala to appreciate and freshen and appreciate. And today I share with you to enjoy! 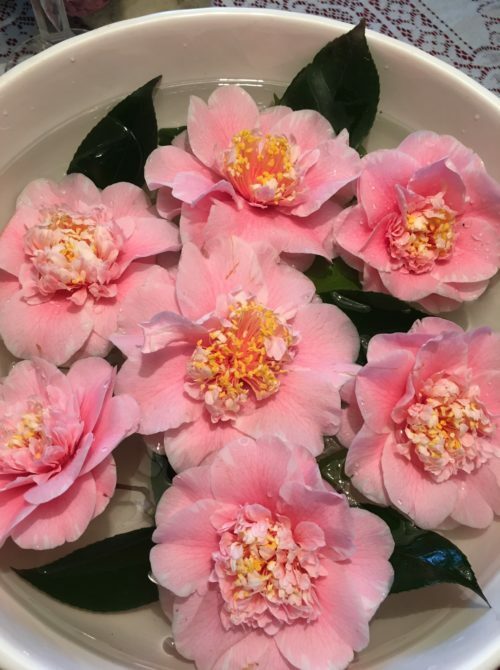 I wish I knew the names of any of these camellias, but, alas, I do not. They have been here for decades and while I fertilize and occasionally prune back, though seldom, I simply stand in awe of their annual beauty with deep gratitude. Last to bloom are these very charming large red ones. They always make me think of Mary Englebreit! 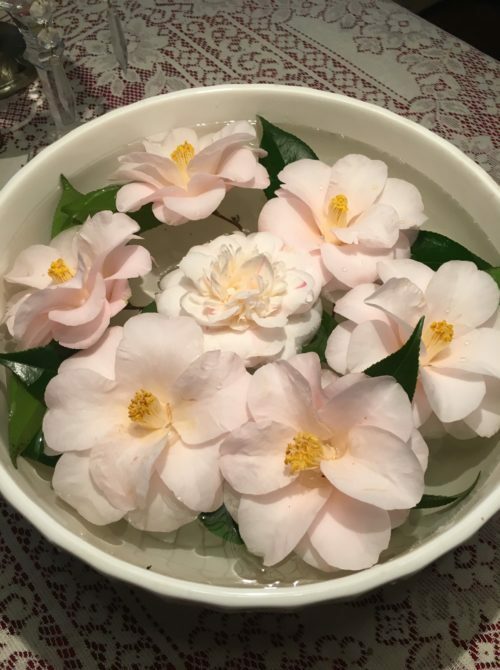 Lastly I share this one special camellia which was given center stage in this arrangement. 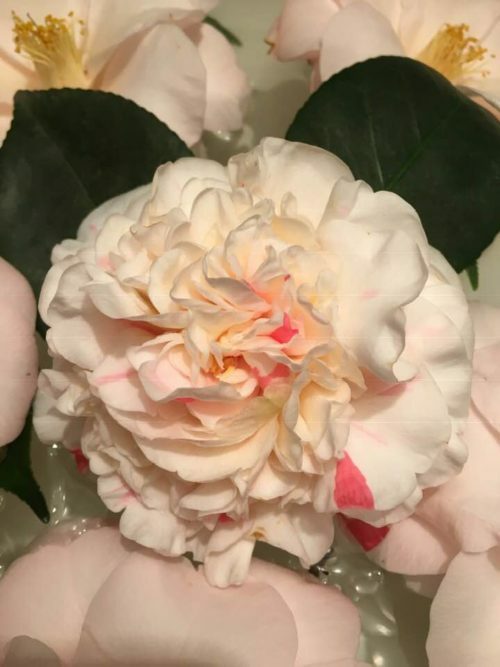 It is one of the very few that carries the scent of a gardenia. It is so incredibly sweet. What a gift from this garden. 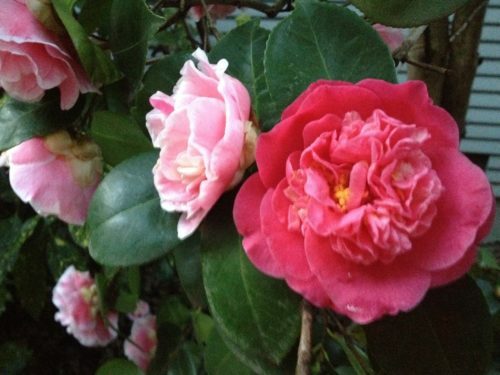 Are you enjoying the first blossoms in your garden? I do hope so! Book Notes: As authors are inclined to do now and again, this morning I googled the title of my book Plant Whatever Brings You Joy: Blessed Wisdom from the Garden and was both surprised and very pleased and grateful that someone had been inspired to create a quote meme for one of the lessons in my book, which I here include for you to enjoy. 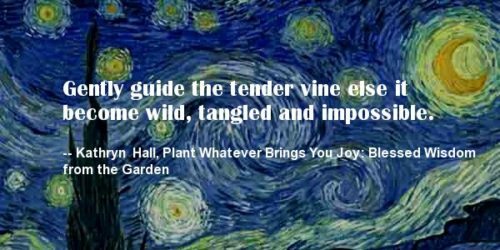 It was showcased on a site featuring quote memes of well known and well read authors, so I was very touched and humbled. Additionally, UK’s Fupping included Plant Whatever Brings You Joy in their article on books to read when you are lonely. Thanks to them! Beautiful! 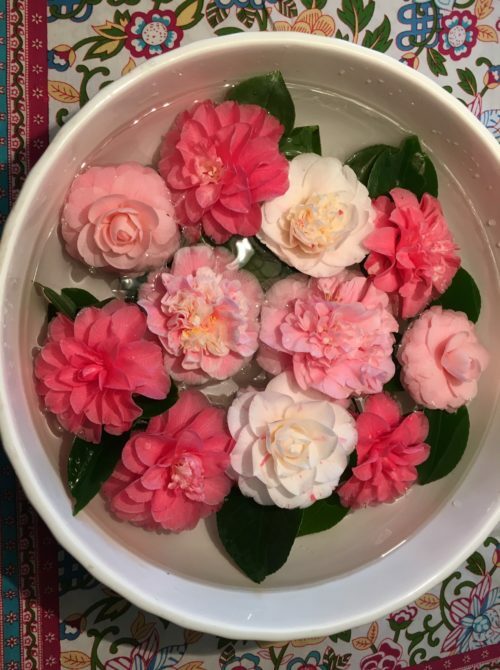 I have long thought one ‘had’ to float camellias to make them last. Those mandala floating flowers are gorgeous. Glad you had decent weather and so much beauty for your birthday! A belated birthday greeting. !!!!! I celebrate my 90th birthday tomorrow. !!!!! I know how blessed i am…. No pains and mobility as always. I am glad we are still in touch, after all these years. Happy birthday month Kathryn. I like Antonia’s description of floating mandalas! My creative mother used to take out a crystal pedestal dish and float hers. A sign of the season. As always, I am simply in awe of what grows in your garden. We have winter crocus, snowdrops, daffodils are up but not in bloom yet here. We were in Charleston WV over the weekend and their daffodils are starting, forsythia are going well and all the escaped Bradford/Calgery pears. Ohio has been very slow to wake up this spring after our terrible winter.